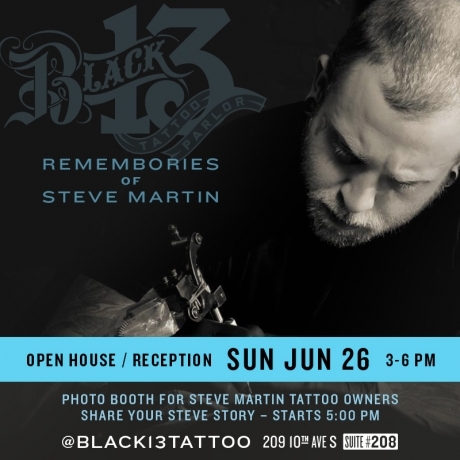 On Sunday June 26th we will be gathering at Black 13 Tattoo to reflect on the life of Steve Martin. Our open house/reception will be from 3 to 5pm with a designated time to share your stories about Steve from 5 to 6pm. PLEASE NOTE - Our building is closed on Sunday so the main entrances across the front will be locked. Please enter in the main central lobby entrance where the security guard will let you in (2nd entrance from the corner of 10th and Demonbruen). Free parking will be provided in the pay lot across the street from our building. Light refreshments will be provided. We will live stream video/audio during the speaking section from 5 to 6pm. The stream will be available on our FaceBook page. We will be taking photos of Steve’s tattoo’s throughout the afternoon and everyone is welcome to join. If you’ve been tattooed by Steve and are unable to attend, please send photos of your work if you’d like to be included in our project.